Charles and Susan Chu's Boama Corporation's sophomore Drefong was particularly impressive defeating older horses in Saturday's Breeders' Cup Sprint, racing most of the way on the lead and turning away Masochistic in the stretch to win by 1 1/4 lengths. The son of Gio Ponti covered six furlongs over Santa Anita's fast main track in 1:08.79, cementing jockey Martin Garcia and trainer Bob Baffert's recently renewed relationship. The win is the fifth Breeders' Cup victory for Garcia, the 13th overall for Baffert and his fifth in the Sprint. Masochistic, having undergone extensive gate practice in the weeks leading up to the Breeders' Cup, was extremely sharp at the start of the race, out-breaking the field by nearly a full length. Drefong and Delta Bluesman were also quick into stride, however, and before Masochistic could angle over to the inside rail that pair had rushed up to join him on the lead. Drefong took over the front-running position to clock the first quarter mile in :21.49, with Masochistic no more than a neck behind in second while three-wide outside Delta Bluesman. They were followed by Noholdingback Bear, A. P. Indian, and Mind Your Biscuits. Entering the far turn, Masochistic moved up to challenge Drefong, and for a moment it looked as though he would blow by his three-year younger competitor as they marked the half in :44.03. Garcia was patient aboard Drefong, and allowed the colt's position along the inside rail to be his advantage throughout the turn, not asking him for everything he had until the pair began to straighten for home. Masochistic had his head in front nearing the top of the lane, but as soon as Drefong changed leads the race was over. The Baffert trainee accelerated away from Masochistic impressively, drawing out his margin of victory to 1 1/4 lengths and maintaining that to the wire. Masochistic had to settle for second, with Mind Your Biscuits rallying from well off the pace to be just a nose behind him in third. A. P. Indian finished fourth. “We drew a great post down the inside,” Garcia said. “My horse broke sharply and came out running. My horse likes to run on the lead and ran hard every step of the way. Bred in Kentucky by Frederick M. Allor, Michael T. Barnett, Anthony M. Warrender, Drefong was a $200,000 weanling at the Keeneland November sale, then pinhooked through the Keeneland September Yearling sale to be sold to the Tanma Corporation for $450,000. He lost the first race of his career after missing the break, but had won his next four starts by a combined 21 1/2 lengths, including the G1 King's Bishop at Saratoga. His win in the Breeders' Cup Sprint improves Drefong's record to five wins from six starts, with earnings of over $1.2 million. 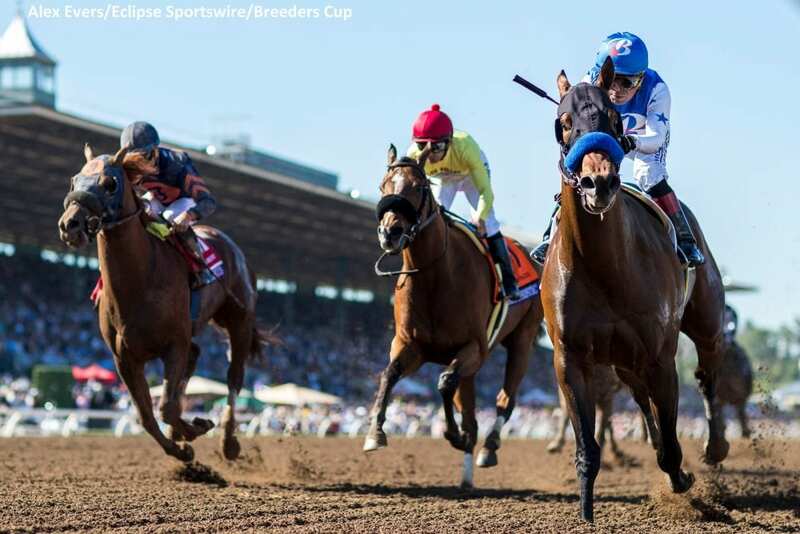 This entry was posted in Breeders' Cup, Videos and tagged Bob Baffert, breeders' cup sprint, drefong, gio ponti, Martin Garcia, Masochistic, santa anita by Paulick Report Staff. Bookmark the permalink.